In reviewing Penn Virginia Corp's recent materials, I noted a few items of interest. First, the company seemed to imply that it has temporarily slowed down exploration in the Haynesville/Bossier Shale because of low natural gas prices. They are still drilling, but not at a frenetic pace. No surprise there, I suppose. The company has about 55,000 net acres, most of it in Harrison Co., TX. Management believes after some testing that most of it is prospective and they are looking at 240 gross drilling sites. In recent months, the company has switched to a program of ten fracture stages per lateral, up from eight. This has increased rig costs to the $8.0 to $8.5 million range, but it has helped recovery. Initial production rates on its two latest wells for 30 days was 7.2 MMcf/day (3 day IP was 10.5 MMcf/day). This has caused Penn Virginia to adjust its expectations for ultimate recover (EUR) from 5-6 Bcf to 6-7 Bcf. For the revised type curve below, the company uses 6.6 Bcf. 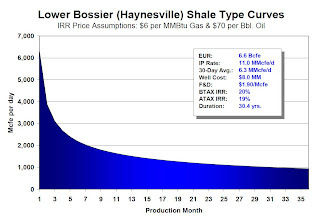 That's a pretty strong number for the Texas side of the Haynesville Shale.